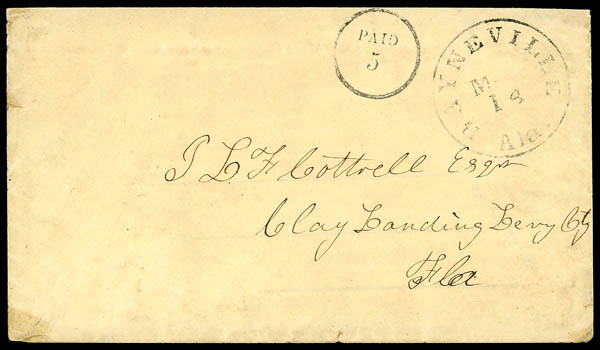 Confederacy, (Alabama) Haynesville Ala., two covers, first with "Haynesville Ala" cds and matching sharp "Paid 5" in circle rating handstamp (CSA type A), to Clay Landing Fla.; second with "Haynesville Ala., Oct 16" cds with matching bold "Paid 10 Cents." 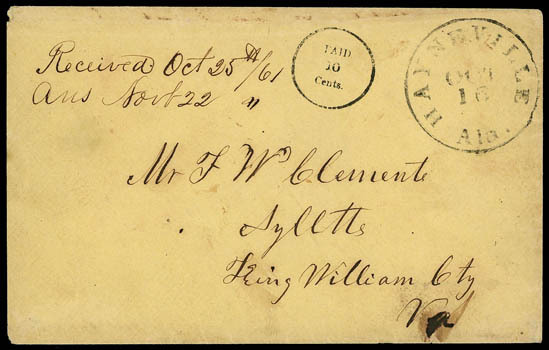 in circle rating handstamp (CSA type D) to Aylett Va., 1861 docketing, Very Fine. C.S.A. Catalog No. A, D; $700 Estimate $300 - 400. Confederacy, (Alabama) Talladega Al., Mar 22, cds with matching "Paid" and "5" rating handstamps on orange cover to Jacksonville Ala.; reduced at right, otherwise Very Fine. 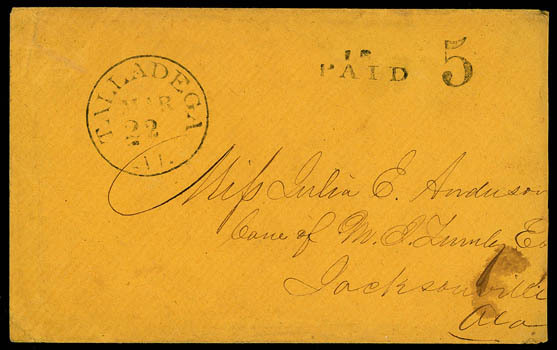 When used, the Talladega Alabama provisional envelopes are indistinguishable from stampless usages. 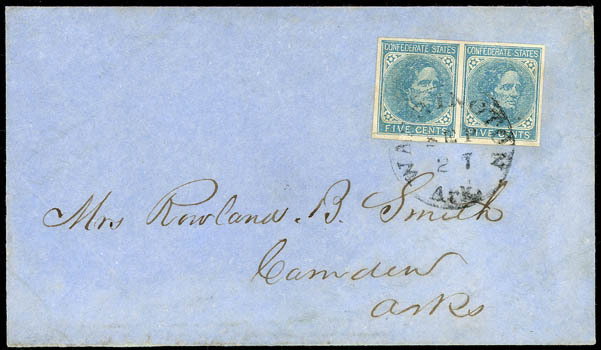 Confederacy, (Arkansas) Hillsboro, Ark, Aug 10, clear strike of cds ties 5¢ blue (7) horizontal pair, clear to large margins, on homemade brown cover to Maj. R.B. Smith at Camden Ark., endorsed "Private" at top, Very Fine. 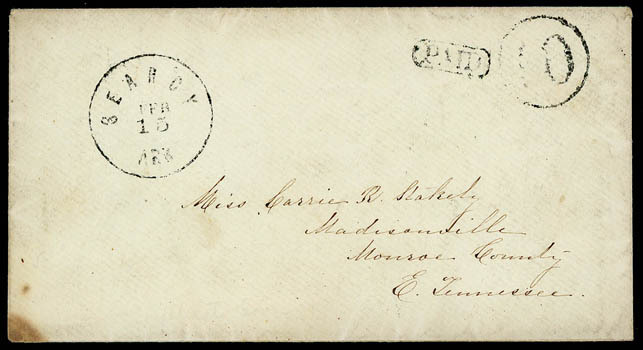 Confederacy, (Arkansas) Searcy, Ark, Feb 15, clear strike of cds with matching framed "Paid" and "10" circular rating handstamp on cover addressed to Miss Carrie R. Stakely, Madisonville County, E. Tennessee; minor lower left corner toning, Very Fine and scarce Arkansas town marking, ex-Agre. Confederacy, (Arkansas) Washington, Ark. Sep 27, cds ties 5¢ blue (7) horizontal pair, large margins all around, scissor-cut at bottom left, on blue adversity cover made from printed steamboat form to Camden Ark. 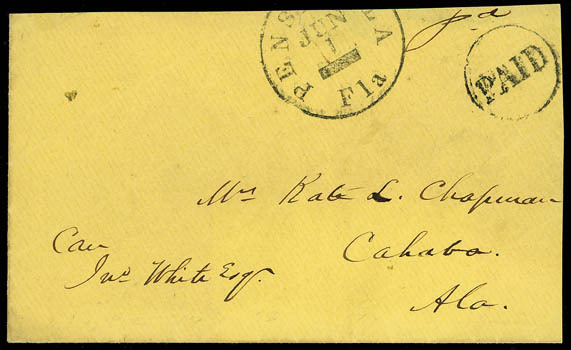 ; some cosmetic cover mends at bottom, Very Fine appearance, ex-John R. Hill Jr.
Confederacy, (Florida) Pensacola, Fla., Jun 1, sharp strike of cds partly off cover with matching "Paid" in circle rating handstamp and manuscript "Pd" on yellow 1861 cover to Cahaba Ala.; small part of flap missing, Extremely Fine; with 1986 P.F. certificate. 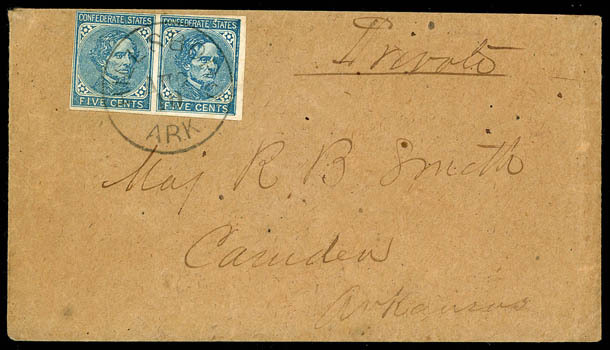 A RARE JUNE 1ST 1861 FIRST DAY OF THE CONFEDERATE POSTAL SYSTEM USAGE, ESPECIALLY DESIRABLE FROM FLORIDA. 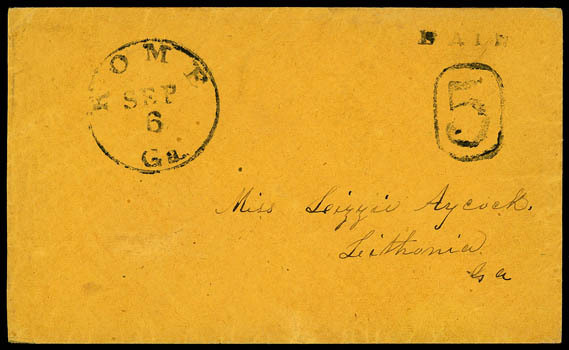 Confederacy, (Georgia) Rome Ga., Sep 6, clear strike of cds with matching "Paid" and large "5" framed rating handstamps (Type B) on orange cover to Lithonia, Ga.; reduced slightly at left, Very Fine. C.S.A. Catalog No. B.
Confederacy, (Georgia) Savannah, Geo. Apr 10, cds with pencil "Due" and red "10" rating handstamp on orange cover with soldier's endorsement "W. Lee Hollifield, Co E 32nd Regt Ga. Vol" to Surgeon H.N. 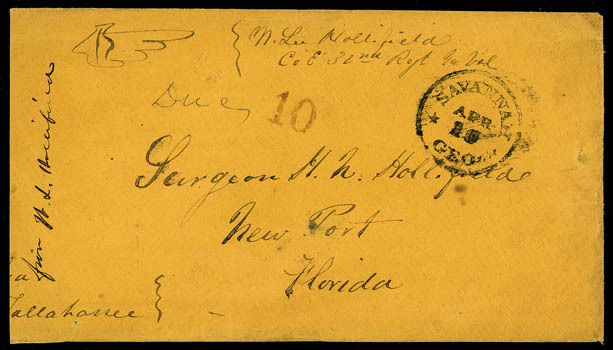 Hollifield at New Port, Florida, endorsed "Via Tallahassee" at bottom left; reduced slightly at left, F.-V.F. 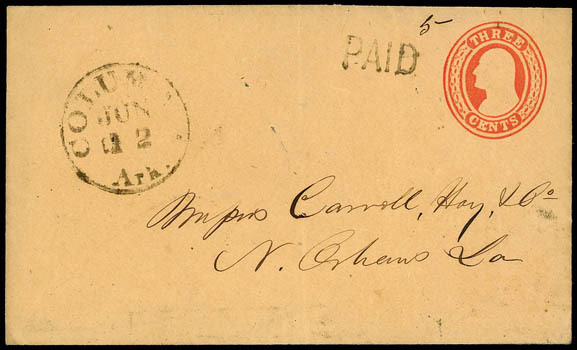 Confederacy, (Georgia) Sparta Ga., Nov 13, red cds with matching "Paid" in circle handstamp overstruck by bold red "10" rate marking (CSA type D) on 1861 folded letter to Private Wells Thomson, care of Col H.D. 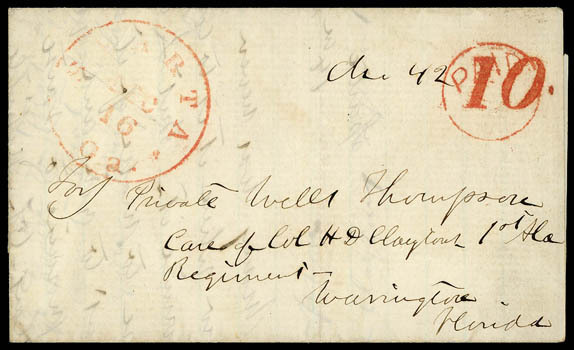 Claytons 1st Ala. Regiment, Warrington Fla., Very Fine.